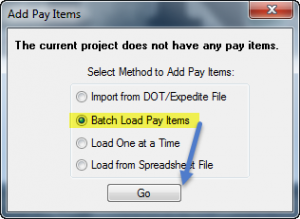 When creating a new estimate and you do not have access to an electronic bid file from the owner or a spreadsheet file of the project pay items, you can use a process called “Batch Loading Pay Items.” This process allows you to pick pay items from a master pay item list and then load only those selected items into the new estimate. Below you will find a video and a step by step guide that will walk you through this process. When you open a project for the first time, you will see the window shown in Image 1. 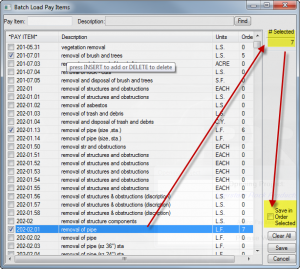 From this window, select the “Batch Load Pay Items” option to start the batch load process. Image 2 will display all the pay items in the master pay item database that you selected when you created the estimate. From this screen, you can select the desired pay items. Clicking the “Save in Order Selected” option on this screen allows you to load the pay items in the order you selected them. Otherwise, the items will be sorted by pay item number. After you have selected all the desired items, press the SAVE button to close this window and display the window shown in Image 3. This screen will only list the items you selected and allow you to enter quantity and other pay item details. Once you have entered the quantity, sort code, phase code and category click the SAVE/CLOSE button to load the items into your project and you are ready to start building your estimate.